Do you feel like, no matter how much progress you make toward changing your drinking habits, you always focus only on the times when you stray from the path to your goals and constantly beat yourself up over it? Your brain, if left to its own devices, will automatically look for everything that isn’t working, making it difficult to appreciate the strides that you’re making toward achieving your goals. But holding yourself to unreasonable standards, where your brain thinks that you shouldn’t be anything less than perfect and using it as a weapon against yourself if you miss the mark, is detrimental to progress. 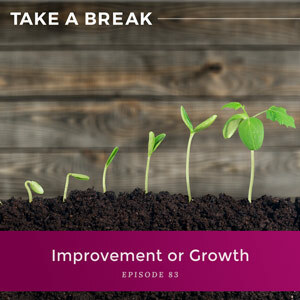 In this episode, we take a look at how using certain kinds of language when we don’t do as we planned impacts meaningful growth and how a subtle shift can make all the difference when you’re trying to change your drinking. The detrimental effects of beating yourself up over missing a mark. The difference between the mindset of improvement and the mindset of growth. How a small change in your thinking can help you change your drinking habits. 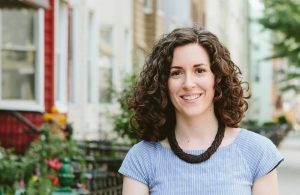 You are listening to the Take A Break podcast with Rachel Hart, episode 83. Well, welcome back everybody. We are talking about a really important topic today, and it’s one of those things where I hope you will see by the end how a subtle shift can make all the difference. This is what I love about this work. Oftentimes, all we have to do is just kind of tweak our language, make a subtle shift in our thinking or our perceptions, and it can create huge change. I was working with a client recently, and she’s had really amazing successes. She no longer feels as if the decision to drink is just this automatic thing that’s outside of her awareness, that she doesn’t have control over, and the habit of drinking is no longer part of the daily routine for her. So, I know a lot of you guys can relate to this, the idea of every evening, you’re pouring yourself a glass of wine, or every evening, you’re cracking open a beer. She was no longer doing that, so she was drinking way less, because again, when you tally up what a nightly habit looks like, it really adds up, over weeks, and months, and the course of a year. So, she had all this amazing success, but she was still frustrated, because she wasn’t where she wanted to be. Her brain could spot everything that wasn’t working. And I wonder how often your brain does the same thing. I know my brain, if left to its own devices, if I’m not supervising it, will look for everything that isn’t working, right? Our brain is really great at spotting the negative. It used to be something that was incredibly helpful. It used to be an evolutionary advantage to be able to spot the negative all the time. Well, it’s not so helpful anymore. That’s what, really, her brain could see, everything that wasn’t working, all those kind of successes, the fact that the decision was no longer automatic. It was no longer outside of her awareness. She now had understanding for how the think feel act cycle worked, how it was motivating and creating desire for her, the fact that drinking was no longer a daily part of her routine. All of that, her brain just kind of pushed aside and said, “No, no, no. Let’s focus on what’s not working.” So in short, her brain was really good at spotting the negative. My brain’s great at that too. Your brain is probably great at that as well. And what happens is, then, it’s hard to appreciate the strides that you’re making if you only see what isn’t working. But, you know, then I really pressed her, and I said, “Okay, fine. You intellectually understand what you should be doing, that it’s good not to be hard on yourself, but does your brain really believe that if you stop being hard on yourself, if you start being nicer, if you start having more compassion, that you would actually head in the right direction?” And I want you to think about this for yourself as well. You may intellectually understand, “Yeah, yeah, yeah,” you shouldn’t be so hard on yourself, but does your brain actually believe that the opposite, being nicer, being kinder, being more compassionate, would truly lead to change? It was interesting, because she really thought about it for a second, and she said, “Yeah, I don’t believe that. I intellectually understand that I should be nicer, but what my brain actually thinks would happen would be that I would be giving myself a pass, right? If I stopped cracking the whip, I’d definitely be drinking too much. I’d probably gain weight. I’d be pretty irresponsible. I’d probably have a dirty house, and I wouldn’t be a very good mom.” And clearly, the list would have gone on for her. And I think a lot of people can relate to this, this idea that, “Okay, fine, yeah, I’m supposed to be nicer, but I don’t actually really think that’s how it works,” and that’s what I want to talk to you about today. I really want you to understand what happens when you’re hard on yourself. Is it truly helping or hurting? And does kindness and compassion, rather than discipline and punishment, can those two things really fuel change? So when you think, “Oh, I’m always screwing up. I’m never going to get this right,” what do these thoughts create for you? What feeling is created? Now, I will tell you, just from the get-go, I think most of you will be able to recognize, these are not thoughts that create positive emotions. “I’m always screwing up. I’m never going to get this right.” No, when you think these thoughts, you’re going to feel things like guilt or hopelessness. You’re going to feel negative emotion, and now the question is what happens when you feel these negative emotions? What actions are driven by these feelings? But I’ll tell you that the result always is slowing yourself down, because what will happen, you’ll have these thoughts, “I’m always screwing up. I’m never going to get this right.” You’ll feel the negative emotion of guilt or hopelessness, and likely, you will spend time ruminating, and dwelling, and beating yourself up, and then, if you are spurred to take action out of this, out of this feeling, guess what’s going to happen the first time that you don’t do what you planned on doing. Well, you’re going to fall right back into this cycle, so it really, really does slow down progress. Now, I’m not suggesting that you should never feel the emotion of guilt, right? The ability to feel guilt is a good thing. You don’t want to be a sociopath, but it becomes problematic, because invariably, you’re probably feeling guilt about a lot of areas of your life. You feel guilty about your drinking, and guilty about what you ate last night, and guilty about then judging yourself, and maybe guilty about judging your body, or guilty about judging other people, or guilty about not having enough gratitude, guilty about your parenting, guilty about your relationship. I mean, the list really can go on, and you can see, if you’re feeling guilty about all these things in your life, because of course your brain is only spotting what isn’t working when it comes to all these different areas, it is going to slow you down, because even if you do end up taking action, it comes with such a hefty dose of dwelling, and focusing on the negative, and judging yourself negatively, and beating yourself up. And listen, now that you understand how the think feel act cycle works, you have heard me talk about, time and time again, how one of the reasons that we find things in our environment like having a drink, or eating something, or spending money, whatever it is, one of the reasons that we start getting into the habit of these things is so we can feel better, because we have all these negative emotions that we don’t know what to do with. I promise you this. If you are hard on yourself, because deep down you really believe that that’s how you’re going to create change, it will backfire. Being hard on yourself, punishing yourself, never works in the long run. I had a really hard time, myself, wrapping my brain around this, until I understood the think feel act cycle, until I could see how my thoughts were actually playing out in my life, because guess what happens when you don’t live up to your standards. You just create more negative emotion, and guess what the habit of over-drinking, and overeating, and overspending is often a response to, looking for relief from how you feel. Do you see the problem? Right? The harder you are on yourself, the more negative emotion you create, the more opportunity there is to look for relief, and you have unknowingly trained your brain to look for relief by drinking, and eating, and spending, and whatever else. So, I know some of you are listening to this right now and thinking like, “Okay, so what? Like, I’m just supposed to be a softy? I’m just supposed to tell myself that it’s fine, and just give myself a pass all the time, that it’s okay to make mistakes, it’s okay to not follow through with what I said I was going to do?” I know this is what you’re thinking, because this is what I feared. This is what people really fear, that the alternative is just, you know, kind of letting ourselves be run over by our own selves. We are so used to thinking and being punitive that we think the only option is to give ourselves a pass, and if we give ourselves a pass, then of course we’re going to drink too much. Of course, we’re going to eat too much and gain weight. Of course, we’ll be irresponsible. Of course, we won’t ever pick up anything around the house. Of course, we’ll be a bad partner, or of course we’ll be a bad parent. I want you to consider this, and this is where the small shift comes in. I want you to consider that what you actually need to do is upend the entire paradigm when it comes to how you create change. Instead of focusing on the idea of constantly improving yourself, I want you to think about shifting improvement to the idea of growth and growing. Now why does this matter? From first blush, it seems like a pretty small change, shifting from improving to growing, but it matters, because being hard on yourself ultimately is always all about fixing yourself. “I have this problem, I got to fix it. I made this mistake. I got to fix it. I got to be better. I got to improve.” Growth, on the other hand, is not about fixing. It is about evolving. Your brain is not fixated on making yourself better, but actually stepping into the next level of you, of evolving. And all you have to do is look at the definition of these two words. When you look at improvement, it is the act or process of making something better, right? Fixing what isn’t working, fixing what is wrong, but growth, growth is a stage or a condition of increasing, developing, maturing, or evolving. I want you to really think about this. In your quest to change your drinking, or change anything in your life for that matter, do you see it as a quest to fix yourself, to make yourself better, to fix what is wrong, or do you see it as a process of evolving, and developing, and growing? Because I bet if you are anything like I was, you have fallen into an improvement trap. “I got to make myself better,” and if you got to make yourself better, it means there’s something wrong with you, and if there’s something wrong with you, guess what, you’re going to be really hard on yourself, because you got to fix yourself in order to feel good. At least, that’s what the brain thinks. You wouldn’t berate it for not being far along enough in the process. You would just accept that that’s not where it is yet. That’s maybe not where it’s going to end up. It’s not going to stay a sapling forever, but you wouldn’t look at it and see this flawed thing. And that really is the difference. You wouldn’t look at a sprout or a seedling and think, “Wow, I really got to improve this. I really got to fix it.” No. It’s growing. It’s developing into something different, right? It’s evolving. It’s expanding. But that is really the mindset that we have with ourselves. We have this mindset of improvement. “Look at all these things I’m doing wrong. Look at all these places where I’m broken. Look at all these areas where I need to be fixed,” instead of seeing it as a process of growth and evolution. And you know, it actually brings me back to something that I’ve talked about before. I’ve talked about how I don’t use … I don’t really like the term recovery, which is a term that’s used quite a bit around people who struggle with their drinking and then end up changing it. So, “I’m in recovery.” Part of the reason why I don’t think the word makes a lot of sense is, when you look at the idea of recovering, or to recover, it’s to become healthy after an illness or an injury, right? To return to normal health. But here’s the thing. When I learned how to change my drinking, when I learned how to stop responding to urges, how to shift my desire, how to not need to cover up my emotions anymore with a drink, I wasn’t returning to anything. I wasn’t returning to quote-unquote “normal health,” because I never had these skills before. I didn’t have any skills on how to manage my thinking, or my emotions, or my urges. No one taught me anything about desire, or how it works in the brain. No one had taught me anything about habits, or the lower brain and the higher brain, right? I didn’t have any of this information, so how was it possible that I was recovering? How was it possible that I was going back to a state of being healthy after an illness or an injury, or returning to normal health? That’s not what happened at all. I was growing. I was evolving. I was expanding. I was developing. I was stepping into something new, right? That’s what happens when you learn. You grow. I didn’t go back to some previous place before I started drinking, because that place is what started and what caused my over-drinking in the first place, because I didn’t have the information or the tools. I had to evolve to the place where I am now. Are you being hard on yourself because you think that anything less would just be giving yourself a pass, and that change would never be possible? Because being hard on yourself, punishing yourself, it does not work in the long run. All you have to do is understand how your thoughts create your feelings and your feelings drive your actions, and you’ll be able to see that berating yourself, beating yourself up, it doesn’t work. All it does is create more negative emotion, and the more negative emotion you have, the more you will look for relief from how you feel, and the more your brain will turn to eating, and drinking, and spending, and finding any number of other ways to bury your head in the sand and cover up how you feel, because that’s what your brain knows how to do right now. That’s what my brain only knew how to do, but I evolved. I learned. I grew. I developed into something else. So listen. You can be on a journey right now of improvement, or you can be on a journey of growth, and I hope you see how very different they are. It is a subtle shift in how you see the process of change, how you talk to yourself, how you understand what change looks like, but I promise, it makes all the difference. You have to supervise your own mind. It will just want to spot the negative. It will tell you if you’re not hard on yourself, all you will do is drink too much, and eat too much, and spend too much, and have a dirty house, and be a terrible partner, and be a terrible parent. It’s not true. You don’t need to be stuck in this place of always fixing and improving. You can step into a place of growing, and learning, and evolving. And I promise, it feels so much better. All right, everybody. That’s it for this week. If you have any questions, if you want to hear me talk about anything on the podcast, as always, you can drop me an email at podcast@rachelhart.com. Otherwise, I will see you next week.